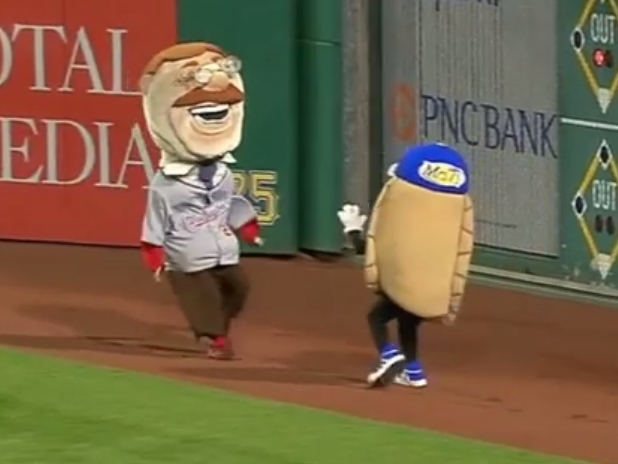 Great Pierogie Race | Let Teddy Win! Saturday’s sellout crowd of over 41,000 will forever remember being witness to Max Scherzer’s near-perfect no-hitter — a performance so dominant that it’s easy to forget the “supporting cast” that made the victory possible: the big RBIs from Tyler Moore, the towering Bryce Harper home run, the spectacular defense by Danny Espinosa and Michael Taylor. 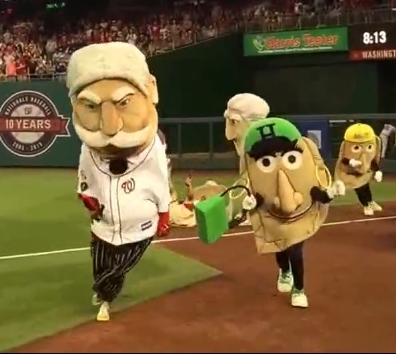 In similar fashion, the Nats racing presidents relied on their supporting cast to vanquish the visiting pierogies from Pittsburgh during Saturday’s fourth inning presidents race. The presidents never go anywhere without their “Secret Service” agents, but the men in black usually keep a low profile. 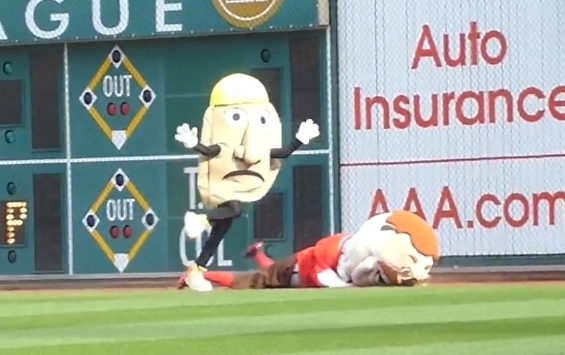 However after Pittsburgh’s racing pierogies came to town Friday and once again tried to wreak havoc on the fourth inning ritual, on Saturday the agents’ role was elevated. 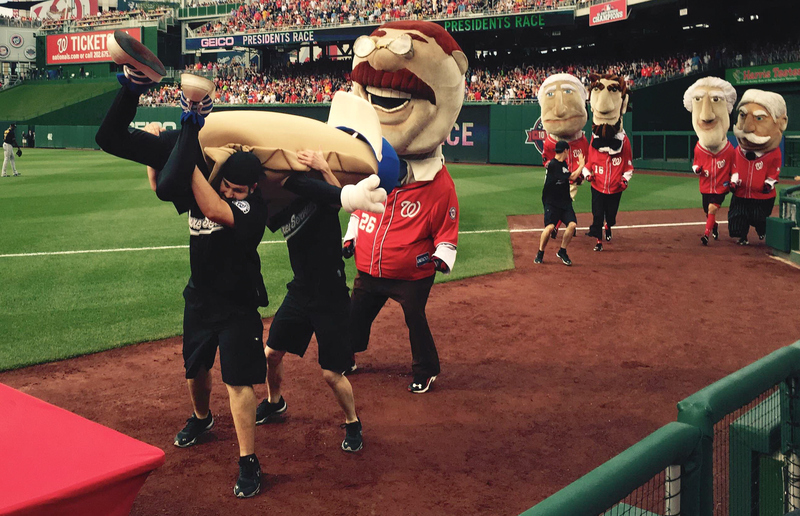 Like an NFL return team following it’s blockers, the racing presidents let the Secret Service clear their path. As they circled the warning track, the agents slammed the visiting dumplings into the dirt, leaving an almost-clear path for the commanders-in-chief. But Theodore Roosevelt’s longtime nemesis Potato Pete had stayed behind, and as Teddy led the pack toward the finish line, Pete launched himself at the Rough Rider from a folding table. That’s when the Secret Service agents intercepted Pete and slammed him into the stands in Section 134-A. 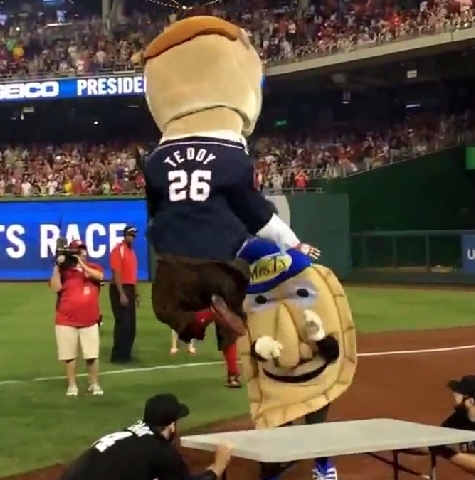 As the pierogie lay writhing on his back in the handicapped section, our 26th president barreled ahead to claim his fifth presidents race victory of 2015. 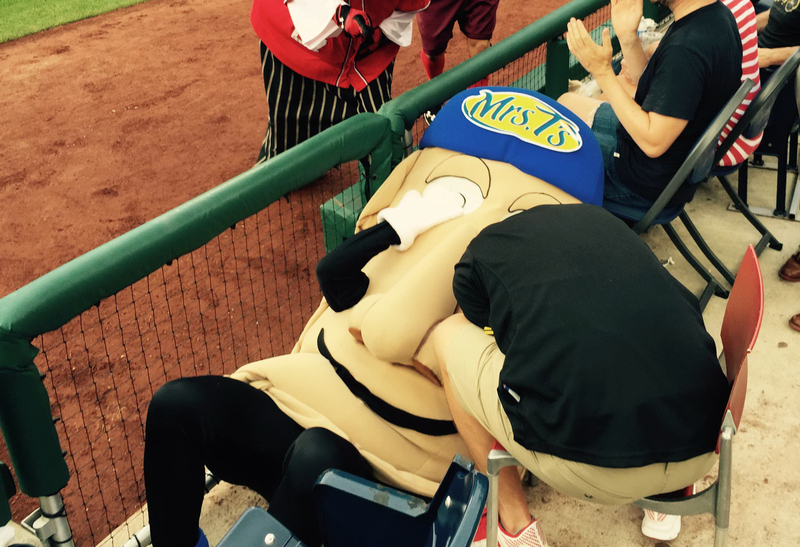 The pierogies will be back on Sunday, giving Potato Pete one final chance to take down Roosevelt at Nationals Park this season. For those who ever wondered whether racing president William Howard Taft was loyal to the home team, any doubt was removed Friday night at Nationals Park. 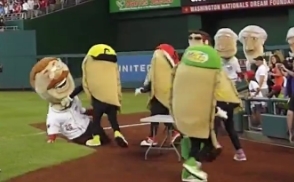 With the Pittsburgh Pirates in town, Taft missed the start of the fourth inning presidents race, instead waiting near the finish line to wave in an onslaught of racing pierogies from Pittsburgh’s PNC Park. Taft then sent the interlopers after his fellow presidents, and it wasn’t pretty. Bacon Burt missed Jefferson, but Sauerkraut Saul was right behind him and managed to take out TJ with a nifty spinning move. Oliver Onion finished George Washington and Cheese Chester took out Abraham Lincoln, which left Potato Pete, who has a history with Teddy Roosevelt, to knock out his nemesis. Jalapeño Hannah stayed out of the melee but ushered the traitor Taft across the finish line. 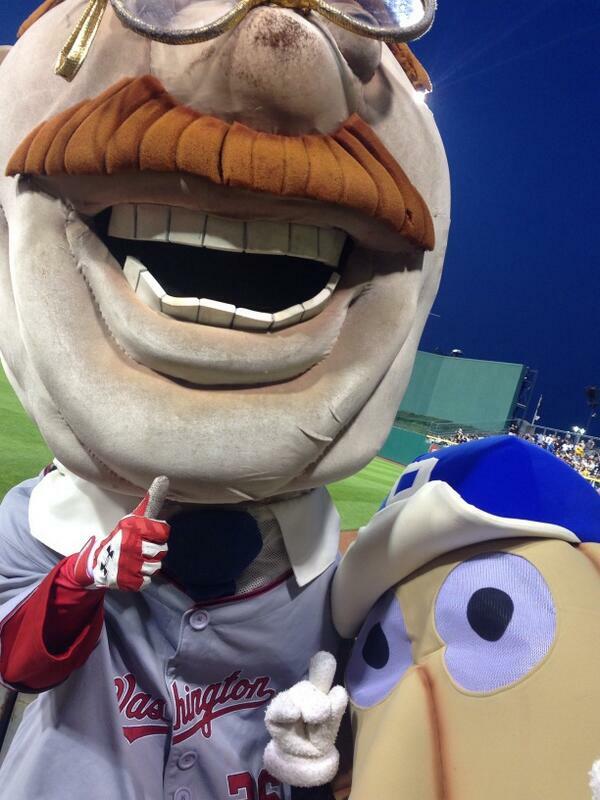 This was the eighth year that the pierogies have visited Nationals Park, but the first time six made the trip. We should expect more antics from the visiting dumplings this weekend. On Friday night at Nationals Park, the Pirates returned with the Pierogies, and The Hero of San Juan Hill was waiting for him. The racing presidents ceded the field to the their Pittsburgh counterparts, then ambushed each of them, leaving the last one, Pete, for Teddy. 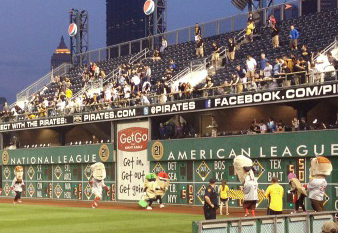 Pittsburgh’s racing pierogies and Washington’s racing presidents have a history of bad blood, including most famously a vicious hit on Teddy Roosevelt by the retired Potato Pete at PNC Park, and one of only two instances in history when the presidents race was sabotaged by a non-president. 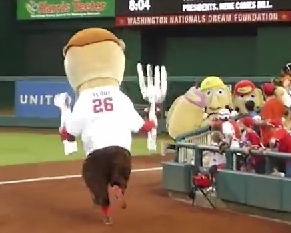 On Monday night the pierogies returned to Nationals Park and joined the fourth inning presidents race, jumping out ahead of the pack, chased by George, Tom, Abe, and Bill. But Teddy Roosevelt was waiting for them in foul territory, yielding a giant fork and knife. 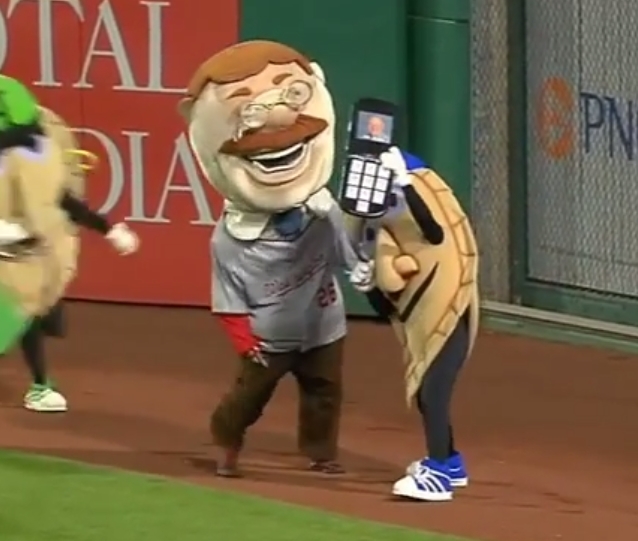 Teddy chased the pierogies back into their pursuers, and as Jalapeno Hannah tried fending them off with her purse, Lincoln raced past for the victory. 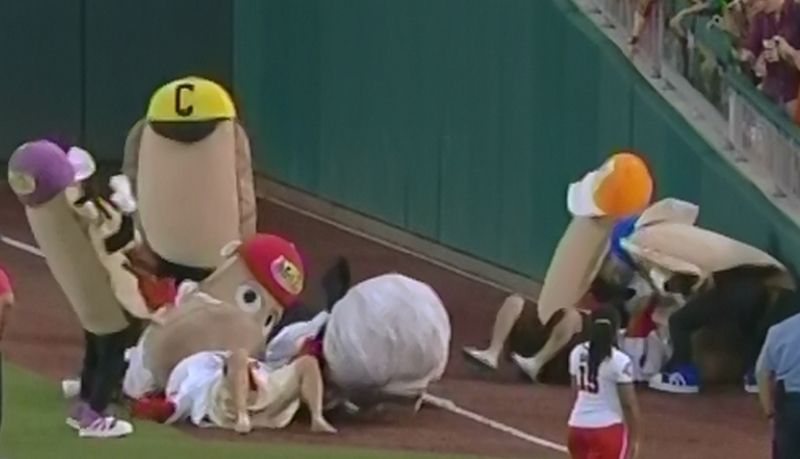 On Tuesday night, the pierogies sought their revenge, with Oliver Onion waiting in ambush as Teddy raced toward the finish. Oliver jumped off a table, with Sauerkraut Sal right behind, taking Teddy down as Abe once again raced by. Oliver’s leap captured in slo-mo below. 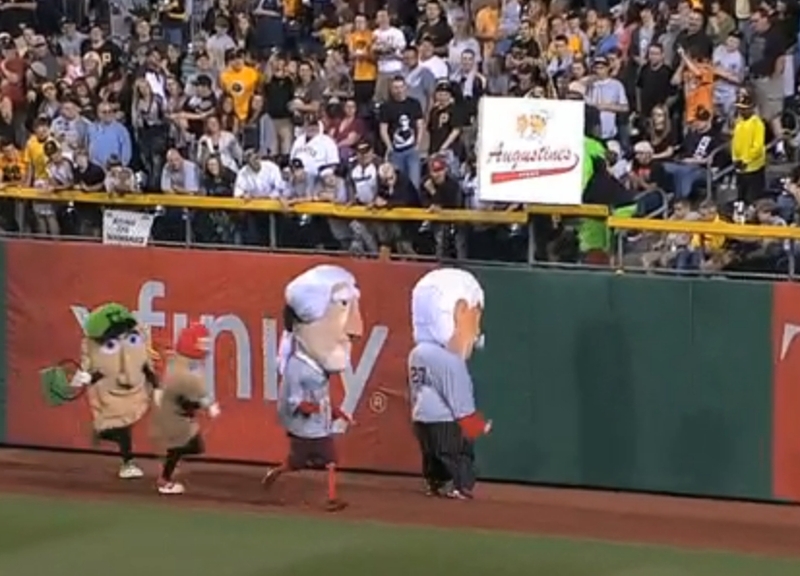 For the sixth straight year, The Nationals racing presidents accompanied the team to Pittsburgh’s PNC Park to participate in the host team’s Great Pierogie Race. For the sixth straight year, the presidents came up short. 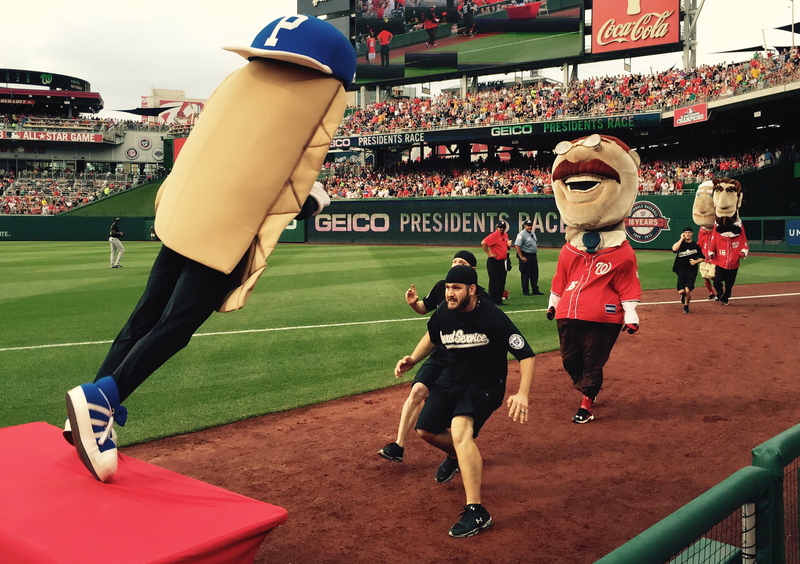 The weekend’s antics included relay races and promising starts for the Nationals’ fab five. However, the presidents were once again undone by overconfidence, distractions, and plain old Pierogie aggression. On Friday, William Howard Taft held a sizeable lead, but stopped cold when the Pittsburgh Parrot appeared dangling a large pizza over the field. On Saturday, it was Teddy Roosevelt’s turn to run anchor. The Bull Moose dashed ahead on the anchor leg, but tripped after turning to taunt Cheese Chester. Chester leapt over the fallen Teddy to keep the presidents winless in Pittsburgh. The racing presidents accompanied the Washington Nationals to Pittsburgh’s PNC Park this week, marking the fifth straight year the presidents have faced off with Pittsburgh’s racing pierogies. PNC Park has never been kind to the presidents — particularly Teddy Roosevelt, who famously got leveled there by Potato Pete in 2009. Perhaps that’s why he and sat out the first race of the series Tuesday night. As George Washington and Abe Lincoln squared off against Jalapeño Hannah and Sauerkraut Sal, Teddy and Thomas Jefferson manned the finish line. As they always seem to do at home, the pierogies trounced the presidents.